Can you see through the trickery, deception, and general foolery of these Arboretum critters? What’s growing on this tree bark? 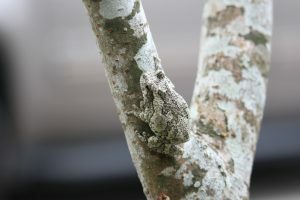 The lumpy bark on this tree is actually a gray treefrog. Treefrogs use their amazing camouflage to hide from predators like birds and snakes. Are these bees or wasps? It’s a trick question! The one on the left is a harmless Virginia flower fly, and the one on the right is an equally defenseless beetle. 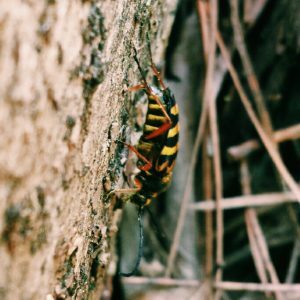 These two insects pretend to be scary, stinging wasps or bees to protect themselves from predators. What tree does this stick belong to? 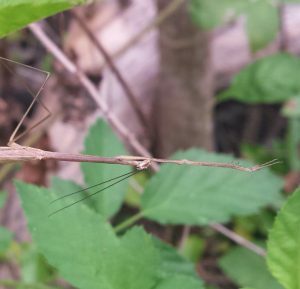 That suspicious stick is actually a grass mantis. 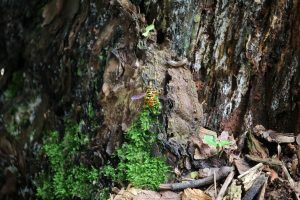 These slender, brown insects are vicious predators and rely on incredible camouflage to sneak up on their prey. 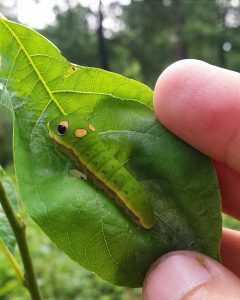 This is not a snake, it’s a spicebush swallowtail caterpillar. It has bold eye-like markings on its back that make it look like a scary snake, and when threatened it will raise its head like a serpent. Most birds will think twice about trying to eat such a deadly-looking creature. Want to learn more about nature’s mimics, tricksters, and pretenders? Join us on Saturday, April 1st for Nature Revealed: April Fools’! from 9:30-11:30 am.